This year the admission yield season and rhubarb season coincided and I almost missed rhubarb season. There was a time when I would not have been sad about that but I have changed how I feel about rhubarb over the past few years. 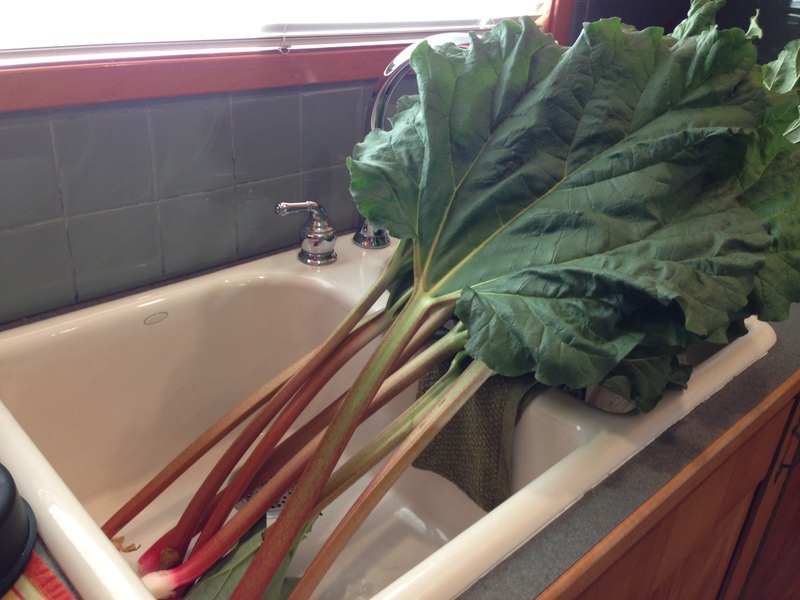 Years ago, when Jack brought home three of his grandfather’s rhubarb plants, I was not excited or encouraging. As a child, I had an experience with a stalk of rhubarb and a cup of sugar that left an unpleasant memory. The rhubarb pies or rhubarb/strawberry pies I tried over the years seemed slimy or slimy and sour. I was always more than happy to give our rhubarb to anyone who got excited when I said we had rhubarb. A few years ago, I tried the Rhubarb Crisp a la mode with Strawberry Sauce recipe from our local newspaper which was adapted from Sylvia Thompson’s “The Kitchen Garden Cookbook” and it changed my life. 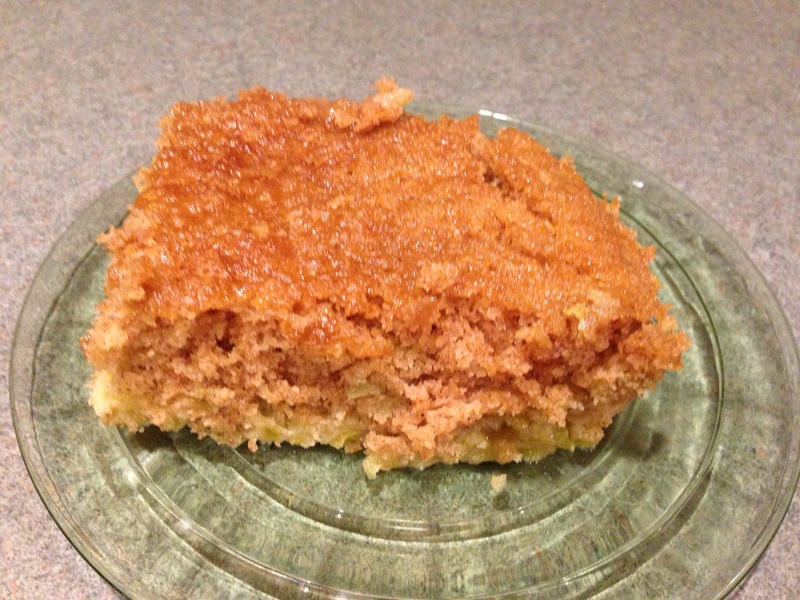 Next was Martha Stewart’s Rhubarb Upside Down Cake–delicious! My fear of the slimy and sour are gone and now it’s great fun to see what I can make with all my (notice it’s now my) free rhubarb! When I was in Juneau two summers ago visiting Mitch and Rochele I picked up a cookbook titled “Every Which Way With Rhubarb” by Amanda Brannon. Until this week the only recipe I had made from the book was a chutney and I was feeling some guilt about yet another cookbook that I haven’t really used, so I pulled it out of the cupboard and took it for a spin. I do have a rhubarb recipe rule which is it has to use a LOT of rhubarb otherwise it’s not worth putting on the garden clogs and trekking to the side yard with a butcher knife to harvest. This week I tried two recipes, Rhubarb Crumble Bars which used four cups and Rhubarb Cake II which used two cups–both were delicious but I really like the Rhubarb Cake II. It was moist and slightly sweet; a perfect snack cake! Preheat over to 350 degrees. Grease and flour a 9 x 13 inch cake pan. 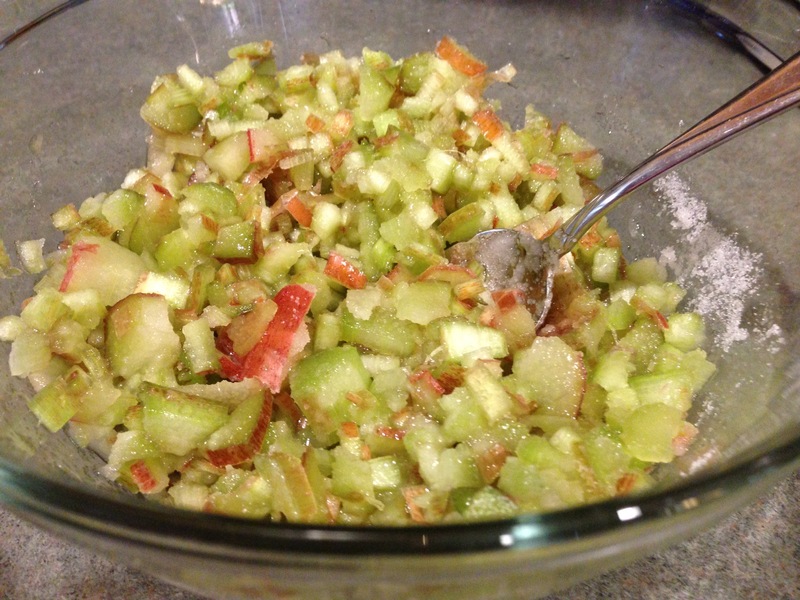 Combine the rhubarb and 1/2 cup sugar. Set aside. In a large mixing bowl, cream the butter and 1 1/2 cup sugar. Add the eggs and beat until well blended. In a medium sized bowl, sift together the flour, baking soda, salt, and cinnamon. In a small bowl, mix together the buttermilk and vanilla. Add the milk mixture alternately with the flour mixture to the egg mixture, beating well between additions. Stir-in the rhubarb mixture. Pour batter into prepared baking pan and bake for about 40 minutes, or until a toothpick inserted into the cake comes out clean. Cool slightly and serve warm or room temperature, plain or with ice cream. Now the Rhubarb Crumble Bars were perfectly nice but vague directions involving cornstarch, water and cooking until “thick” meant my bars were more a crisp and not bar-like. Would have been delicious with ice cream or whipped cream but you certainly could not eat with your hands. I thought they would be more like Smitten Kitchen’s Kim Boyce’s via Orangette Rye Crumble Bars which are the most amazing thing ever. This entry was posted in baked goods, dessert. Bookmark the permalink.